Bainbridge Islander’s are lucky enough to enjoy a healthy variety of restaurants without having to leave the Island. In fact, the island is home to what Eater Seattle has recently called Seattle’s #1 restaurant; Hitchcock by Chef Brendan McGill. Beyond that, Bainbridge Island boasts delicious restaurants like Restaurant Marché by Chef Greg Atkinson, Harbor Public House, Bene Pizza, and so much more. Popular Squamish mainstay the Agate Pass Cafe will be making its debut on Bainbridge Island soon. If all of that wasn’t reason enough to visit Bainbridge Island, then perhaps the dinners at Heyday Farm will be. You’ve never tasted farm-to-table quite like this. Make your reservation at the Eagle Harbor Petit Hotel today, and get ready to be wowed with one incredible meal after another. Heyday Farm is a family-owned sustainable farm on Bainbridge Island. They do more than just sell delicious, sustainably produced goods at their recently-expanded farm store, though. Heyday Farm has truly become a neighborhood gathering place, where they offer occasional public events and classes throughout the year. Last year, HeyDay Farm started an open-seating, no reservation Tuesday Community Dinner from 5:00 – 8:00 P.M. These Tuesday dinners are extraordinary, and should be at the top of every food-lover’s list. 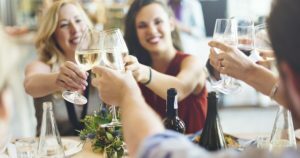 Heyday Farms has also been hosting community wine dinners, one of which is coming right up on October 25, 2018. It features local winemaker Paul Bianci of Amelia Wynn Winery. This November, Heyday Farm is also adding a Sunday community dinner to its regular rotation, with the inaugural dinner happening on November 4, 2018. 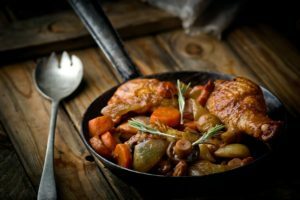 The event has been described as something you’d enjoy straight out of your grandmother’s kitchen; a four-course meal served family-style, with the menu carefully designed to take advantage of the flavors of the fall season. While the food, prepared by owner and executive chef Tadao (Tad) Mitsui, is incredible, it’s really not the best part about these Tuesday dinners. The atmosphere at Heyday Farm’s kitchen is quaint, quintessential Bainbridge, where you can expect to talk to your neighbors and make a new friend by evening’s end. An evening spent at Heyday Farm is nothing short of magical, and is certainly one of the many things that makes our island a place worth visiting. Come stay with us at the Eagle Harbor Inn this fall, and enjoy a delicious dinner and a bite of community at Heyday Farm.